When it comes to computers and audio, it doesn't get much better than Creative's SoundBlaster line. If you are at least familiar with computer components, then you probably at least recognize the name SoundBlaster. And while the name SoundBlaster is synonymous with high quality audio, Creative has taken things to a whole new level with the SoundBlaster X7. While it provides stellar computer audio, which is the core of the SoundBlaster line, the X7 also provides a whole lot more! The SoundBlaster X7 is an audiophile's dream! Whether it be for a desktop, laptop, portable device like tablet or even cellphone, it also works great with gaming systems. not only does it do gaming, it also works great with movies and music. The SoundBlaster X7 is a high resolution aural juggernaut that can take care of all your sound processing needs! With it's 24 bit/192 kHz high resolution 127dB processor, everything you listen to will sound better than it ever has before! There's even an app so you can control it from your iOS or Android device, whether you want to keep the sound untouched, or alter it to your personal preferences. The SoundBlaster X7 really is designed for you, and your needs. Do you have your music stored on your cell phone? No problem. The X7 uses Bluetooth and NFC. It's other inputs also include RCA, optical and even USB. Its' outputs include the same. And with the built-in amp, it can be used as a stand alone amplifier to power a pair of stereo speakers. For those of you that have studio quality headphones, the built-in headphone amp can handle impedences up to 600 ohm. And with audiophile grade components such as Nichicon fine gold capacitors, Burr-Brown ADC and PCM 1794 DAC and even swappable op amps to even further customize tonal qualities, you are ensured a pleasant audio experience. Proprietary audio chip helps the Sound Blaster X7 achieve audiophile-grade audio playback from stereo to 5.1 configurations at up to 24-bit 192kHz. The SoundBlaster X7 came in a great color printed box with photos and features and specs of the device. It really helped to set the tone for the excitement that is to come. Opening the box revealed a well protected X7. While construction was mostly of plastic, with gold plated metal connections, the quality of materials used was very good. The fit and finish and quality of construction was also very good. The X7 appeared to be a very well made product. Holding it in hand, the X7 felt very solid as well. Another nice touch was the overall elegant look, so that the X7 would fit in well with almost any décor. Also included with the SoundBlaster X7 were the manual, multiple power cords for depending on where in the world you live, and audio cable for using a device with 3.5 mm cable. There was also a headphone holder that connects to the back of the X7. When it came time to test the SoundBlaster X7, I was very impressed! It was easy to use to power computer system speakers for gaming. It also works great to power a pair of stereo speakers. And whatever location you have it, the X7 lets you easily access all of your content. I had a pair of bookshelf speakers that it powered beautifully. Talk about making you computer gaming sound amazing! This is actually what I enjoyed the most about the X7 and having so many inputs, to access a multitude of difference devices. My Ipod Classic connected with the included 3.5 mm adapter worked great. The built-in Bluetooth made it easy to access the music on my cellphone and tablet. The built-in headphone amp also worked well with my high impedance reference Sennheiser Momentum Wireless headphones. The only thing that could have been made easier is to provide an HDMI in/out to make it easier to connect to a current gaming system like PlayStation 3/4 or Xbox One. The X7 does not just provide the hardware to listen to you music. It also provides the hardware to let you tweak the sound to preference. The built-in sound processor is a powerhouse! It can be customized through DSP for gaming, music, and even movies. There's also a 10 band graphic equalizer. And controlling all this was very simple by using a downloaded app for your smartphone or tablet. The provided sound was also excellent. The built-in amplifier proved to be very transparent. The level of imaging I heard was astounding! I was not expecting that from this small device. The level of resolution and detail was also very good. The highs were crisp and clean, mids were smooth, and bass had nice depth and extension. Vocals sounded very natural with nice timbre. It didn't matter if it was piano, percussion, guitar, brass, strings, or vocals, the X7 provided great harmonics, dynamics, and detail with no noticeable coloration or decay. I found myself getting lost in the music, going to my favorite tracks and singing along. I had to remind myself to stay on task! I guess that's probably the best compliment that can be given. My teenage son fell in love with it! The Creative SoundBlaster X7 arrived, and with Creative's reputation I had high expectation. Those expectations were exceeded! The SoundBlaster X7 had high quality connections, and felt like a well built product. And it also performed in spades. If you are in the market for a small receiver and/or computer soundcard, it should be on your short list, as the X7 can do it all! 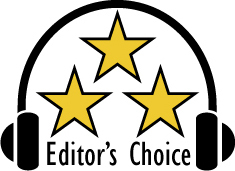 Based on it's design, features, quality, and specs, the Creative SoundBlaster X7 has earned our Editor's Choice Award. Kudos to Creative for such a great product! With an MSRP of $399, it is also priced right. For more info and complete specs, check out their website at www.uscreative.com.